On Thursday, February 11, Army Specialist Alexis Hutchinson, a single mother of an infant son, was informed she would be granted an administrative discharge from the Army. Last fall, Hutchinson was ordered to prepare to deploy to Afghanistan. On November 5, 2009, after her childcare plans fell through, Hutchinson was faced with the dilemma of having no one to take care of her son when she deployed to a war zone. She chose not to show up for the plane to Afghanistan and missed her deployment. When she reported for duty the following day the Army arrested her and took away her son, who was allegedly placed in an Army day care. His grandmother, Angelique Hughes of Oakland, California, picked him up a few days later. 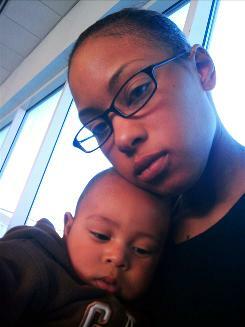 Alexis was granted leave to go home for the holidays in December, and returned to Georgia with her baby, Kamani, in early January. After Hutchinson returned to Georgia in January, the Army filed court-martial charges against her and refused to discharge her under the Army regulations that clearly allow for discharges for reasons of parenthood responsibility. Truthout broke the story on January 14. Both Hutchinson and her civilian attorney, Rai Sue Sussman, are happy with the results. In a press release from Sussman’s office, Hutchinson said that she is “excited to know what will happen to me, and that I am not facing jail. This means I can still be with my son, which is the most important thing.” Hutchinson will receive an “Other Than Honorable” discharge, but will not be facing criminal charges at a court-martial, which would have subjected her to a bad-conduct discharge and up to a year in jail if she lost, as well as a criminal record. Until this recent decision, the Army had opted to court-martial Hutchinson as her commander believed she was attempting to get out of her Afghanistan deployment. Both Hutchinson and Sussman have consistently stated that Hutchinson always fully intended to deploy until her childcare plans fell through. Hutchinson’s mother, Angelique Hughes, was thrilled with the recent news. However, Hughes was concerned about the fact that due to Hutchinson’s “Other Than Honorable” discharge, she will not maintain any of her benefits, like medical care for herself and her infant son. Jeff Paterson, the director of the soldier advocacy group Courage to Resist, which has assisted Hutchinson, felt that the administrative discharge was a victory all around. Hutchinson chose not to speak to the media about the Army’s decision. The Army has regulations regarding parents who miss deployment due to childcare plans falling through. The regulations call for an extension of time to find alternate caregivers, and to discharge a parent honorably if no solution is found. After Truthout reported that the Army had filed charges against Hutchinson, other media covered her situation, including several national outlets. Brigadier General Jeffrey Phillips, Hutchinson’s commander at the Hunter Army Airfield Military Reservation near Savannah, Georgia, made the recent decision to allow an administrative discharge for Hutchinson. While both Sussman and Hutchinson are pleased with the Army’s decision, Sussman feels that Hutchinson’s plight does not send a positive message to parents – especially single parents – who plan on joining the US military today. Currently Hutchinson remains assigned to Hunter Army Airfield near Savannah, Georgia, where she has been posted since February 2008. Hutchinson lives off post and places her son in day care when she goes to work. Sussman told Truthout she believes Hutchinson should be discharged by the end of this month.